Everywhere you might go in Costa Rica, from the capital city of San Jose, to a remote barrio, to a tourist hub like Manuel Antonio you hear people saying “Pura Vida”, Pure Life. The fisherman made the pura vida choice: to take pleasure in what he had, to appreciate the simple gifts of life without scrabbling and scrambling for more. The young man who told us this story offered an interesting explanation as to why the spirit of pura vida may be so attractive to his people. 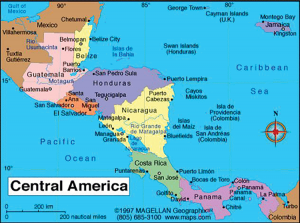 He postulated that in addition to the relaxed optimism embedded in the pura vida attitude, having a philosophical orientation of acceptance helps the Tican people feel less frustrated by the difficultly they encounter when/if they try to climb the socio-economic ladder from low-to-middle or middle-to-high earning status. The palpable pride every single Tican we spoke with exuded as they described how their country has no army, “we are a peaceful people” and how the money that would have been spent on a military goes to pay for education and healthcare, how they are friends to everyone and try to live in harmony, was arresting and enviable. Costa Rica is the most splendidly lush garden of ecological paradise imaginable. The natural world howls, barks, zips, whirrs, clicks, buzzes and squeaks with life beneath the unbridled splendor, intense color, endless variation and gracious arms of among countless others, the Guanacaste trees, which stand stately, stretching their broad branches, draped as if with jewels, with orchids and bromeliads. Intimately connected with all this teeming life, almost invisible among the larger more glamourous plants and animals, are the bees. Looking about, on the blossoms, which were everywhere, we did not at first see what we recognized as honey bees, but rather what looked like hundreds and thousands of tiny, pollen-laden flies. We were soon to learn better on an excursion to Reserva Natural Tocori. Having spoken with Miguel Gamboa, the owner and primary beekeeper of the reserve we knew we would encounter Africanized bees but really had little more than that to go on. As we drove out of town and into the countryside the roads became steadily bumpier and dustier. We eventually climbed a small mountain to arrive in a primeval-feeling forest where Miguel and his family tend 18 hives of Africanized honey bees (AHB), a few colonies of stingless bees, and a curated educational center and hiking trails. Before describing the wonders we experienced allow me to jump back in time. 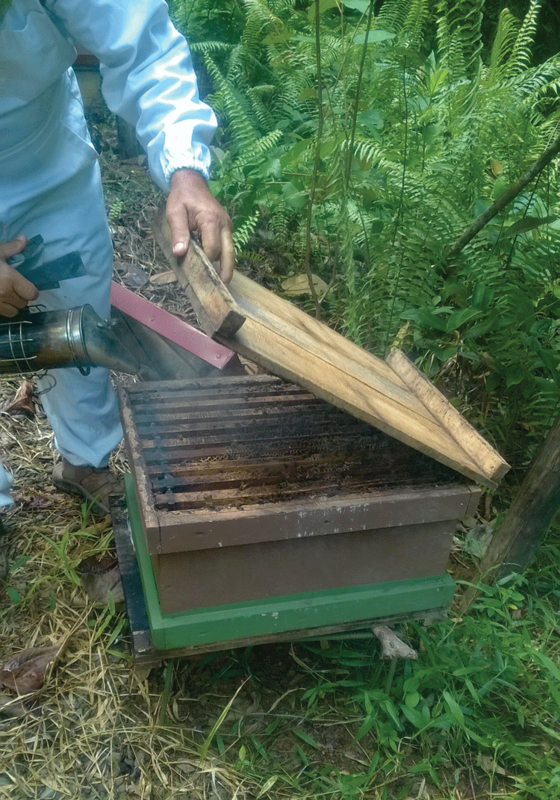 Forty years ago, backyard beekeeping was a common practice in Costa Rica, requiring little specialized gear; just some homemade hives, a few bees and a little knowhow. Then around 35 years ago, the Africanized honey bee, a hybrid of the European honey bee (EHB) and an African subspecies Apis mellifera scutellata, arrived. The Africanized bees, owing to their strong genetics quickly began to dominate and though comingling occurred the AHB genetics came to profoundly influence the local honey bee population. Most casual beekeepers in Costa Rica intimidated by the now highly defensive and at times aggressive temperaments of their formerly mellow bees, abandoned the practice. Some seasoned beekeepers adapted, adopting more protective gear and using more smoke and found that the new bees, though lacking “good humor” were usually manageable and excellent honey producers. Jeff and Miguel in AHB hive. We went to visit just such bees. Tucked away in sparsely treed groves, each hive was situated about 30 ft. from the next. The supers sat upon stands beneath sheltering roofs constructed to protect against the intense sun of the dry season and the drenching rains of the wet season. 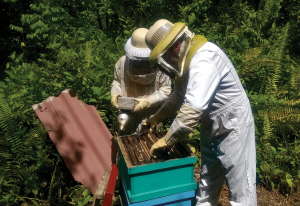 With some trepidation and outfitted so soundly a midge couldn’t have gotten into our suits we approached a colorful, modest hive of two deep supers. The inhabitants did not rush out to attack. 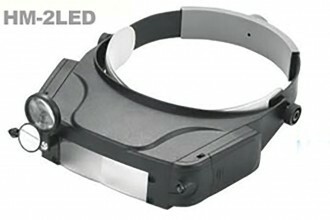 Miguel smoked the entrance liberally and removed the cover. A few guards flew up, buzzing and banging, to check us out. I was still holding my breath. We began to pull frames. The honey-pollen-brood rainbows were lovely. The workers walking about on the comb were tranquil. They were dead ringers for Italians, some as yellow as Cordovans, other darker, no smaller or larger, looking for all the world exactly like a colony from home but with not a Varroa mite to be espied. Embarrassingly, truth be told, though I knew better, I was expecting something sensational, almost cartoonish: huge evil bees, stingers brandished and dripping venom, malice in their eyes, murder in their hearts. Obviously the AHB are not cuddly kittens neither however were these guys ‘killers’. Apiculture in the tropics, as in the temperate zone of Ohio is dictated by the rhythms of the natural world. In Costa Rica there are two seasons: wet and dry. The wet season, in the central west coast region we visited, begins in mid-April and lasts for about eight months, giving way to the dry season in mid-December. From mid-December to mid-April, four short months with lots of sun and very little precipitation, everything than can bloom, seemingly does. Miguel mentioned several trees whose blooms are of particular importance to the honey bees including the Guititi tree, Acnistus arborescens, the Apple Water tree, syzygium samarangense, the Mango tree, Mangifera indica, the Blackwood tree, Gliricidia sepium, which grow in abundance and are used as living fence rows and the Wild Cashew tree, Anacardium excelsum. During this time of plenty, Miguel’s hive populations, which over the rainy season dwindle from 40,000 or so individuals to under 8,000, surge. The queen begins to lay again in earnest, the nurses to nurse, the foragers to forage and the hives boom. Of course, with all this vigor and vim comes the urge to swarm, and just like during strong late Spring nectar flows in Ohio when the hives begin to feel congested, preparations for cleavage are made. Miguel tries to capture as many swarms as possible and often receives calls from the local fire department asking him to remove bees from people’s sheds, trees and homes. By mid-March, when we were visiting, Miguel was about to harvest for the third time in six weeks. Despite the comparatively small head count (40,000 AHB per colony vs. 80,000 EHB) honey production was impressive with each colony generating an average of 80 lbs. over the four-month dry season. This honey, stored in frames of naturally drawn comb on wires, Miguel harvests in a handcrafted tangential extractor. His supers and frames are handmade as well utilizing the wood of local trees such as Cedar, Mango and Guanacaste. After harvesting Miguel must ensure that the bees have enough stores to get them through the long, wet season. Far fewer plants are in bloom during this time. The daily rains wash out the pollen and nectar of those that are in addition to making flying a far less attractive adventure. He allows the bees to keep the honey they make at the very tail end of the dry season from nectar of the May tree (Crataegus sp.) which he describes as very bitter and he feeds, a mixture of sugar-cane and water, as needed. During the rainy season the queen dramatically reduces drone production and as the old fellows die off and are not replaced, attrition negates the need for the dramatic exclusion/execution of the drones we see in Ohio around Labor Day. Miguel sells most of the honey he collects at a nearby market for the equivalent of $6 per lb. He rarely collects pollen, as he believes it’s not good for the bees, but does harvest propolis, royal jelly and wax which he and his daughter Yeimi use to make natural creams and cosmetics. Miguel is often asked to transport his hives to watermelon and cantaloupe fields for pollination but declines because of the many pesticides used on these crops. He doesn’t want to expose his bees to the poisons – pura vida. Miguel does not use chemicals to treat for Varroa. He tells us that about six years ago, his hives, which were at that time lined up with just a few feet between stands, experienced a major Varroa infestation. His response and remedy was to move the hives at least 30 ft. apart, to discourage drift and continual cross contamination and to destroy brood comb. It worked. His efforts were also likely aided by the strongly hygienic behaviors attributed to AHB. Costa Rican beekeepers, as far as Miguel knows, have no problems with Nosema apis or ceranae, American Foulbrood or European Foulbrood. Nor are the hives bothered much by the likes of rodents or larger mammals (other than people). They must contend however with one madly formidable foe: the army or legionnaire ants (Eciton burchellii). These nomadic predatory hordes, often numbering in excess of ½ million individuals, upon discovering a colony, invade and devastate, consuming eggs, larvae, and food stores and after pillaging and plundering slip silently back into the undergrowth from whence they came. Miguel lost four hives to army ants last year. Exploring AHB hives, though precarious and compelling in theory, turned out to be not that different of an experience than looking into a fellow Ohioan beekeeper’s ill-tempered hive. It was interesting for sure, but familiar enough to seem almost routine. If what we were hoping for was something exotic and astonishing, which of course it was, our hopes were to be exceeded by what Miguel showed us next: Melipona and more Melipona. 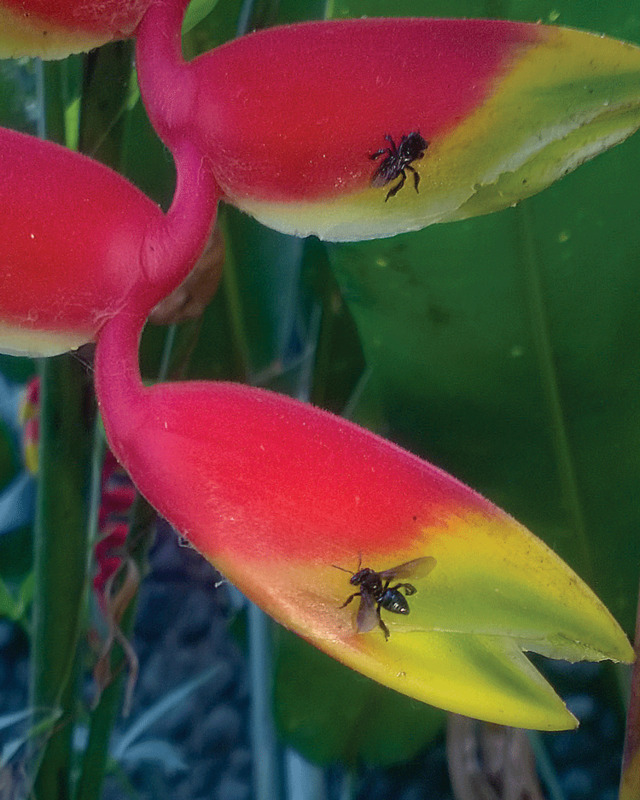 Melipona or stingless honey bees are ubiquitous in the tropics. We encountered only two on this trip that we were able to identify though doubtless saw others. The first was Melipona costarricensis, also known as Melipona beecheii, referred to locally as “Jicote Zoncuano” (the wasp of Zoncuano). In other parts of Central America and Mexico this native bee which has been kept, primarily in log hives, since pre-Columbian times is referred to as the Xunan Kabee or Royal Lady Bee. These eusocial, nonaggressive, dark-colored bees live in small colonies of 500-2,500 individuals. We encountered very similar bees in Cuba five years ago, called by the locals atehas de la tierra, ground bees. (for a full description see the article titled Beekeeping in Cuba, Bee Culture, Sept 2013). These sweet bees, as they are also called, store nectar and pollen, collected via buzz pollinating (like bumble bees) in waxen pots situated around the brood nest which is constructed of horizontally oriented comb layers Miguel called cookies. Over the legions of years that Melipona costarricensis has been in Costa Rica it has become a vital member of the ecosystem, but the same sad story is repeating there as elsewhere: declining numbers primarily due to habitat loss from deforestation threaten its continued existence. Miguel tells us these beleaguered natives also must contend with the parasitic phorid fly, Psuedohypocera kerteszi, which invade nests during the rainy season when colonies are at their weakest. During this time the female phorid or scuttle fly infiltrates the Melipona nest and lays batched eggs in pollen pots and brood comb. Her larvae hatch and consume pollen and the nascent Melipona larvae and pupae. A phorid fly infestation can cause colony death. I mentioned that we were secretly, or not so secretly, hoping to see something amazing on this expedition, here it was, in all its Lilliputian splendor: the Mariola bee, Tetragonisca angustula, also known the angel bee. Tiny and delicate, four to five mm in length with colony populations of 5,000-10,000 individuals, these delightful bees not only look altogether un-honey-bee-ish, their behavior represents some fascinating departures as well. Tetragonisca angustula, angel bee, at hive entrance. Interior of Tetragonisca angustula hive. 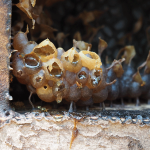 Interior of Tetragonisca angustula hive, open honey pots. For starters, the eusocial angel bee society consists of five (and possibly more) castes. In addition to drones, psyogastric queens and workers, there is a soldier or guard caste; females about a third larger than workers with longer hind legs and a janitorial caste; females bigger than workers but smaller than guards. The evolution of a guard caste is likely a result of the fact that, though stingless, these tiny bees cannot afford to be defenseless. With an average of 30 guards patrolling the nest entrance, a pipe-shaped lattice work of wax measuring about two cm in length with a diameter of 0.6 cm, which the bees close at night, these little soldiers stand a much better chance of detecting and deterring attacks by the much larger obligate robber bees such as Lestrimelitta limao. What I found most interesting about angel bees is their method of colony reproduction. They are said to swarm only once a year, during the dry season. 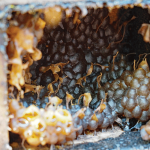 Instead of issuing first and searching for a new nest site second, like Apis mellifera, the angel bees, and this just seems to make so much more sense, send out scouts for two days to two weeks to locate a suitable cavity, and then swarm. They don’t go far, less than 1,000 feet from the parent hive, but then distance is relative to size. During the move thousands of workers, many of whom will ultimately return to the parent hive, come along to help the new colony get established. These helper-bees clean the new nest site, build comb and transfer pollen, honey and wax from the parent nest to the new nest site. The helpers return after a time to the parent hive and continue to have supportive contact with the swarm for up to six months, until it is fully provisioned and productive. Miguel tries, with some success, to encourage the angel bees during the swarm season to move into prepared frameless boxes he baits by spaying the interiors with an extract he makes using propolis from the parent hive. Angel bees seem to be generalist foragers and once we learned to identify them we saw them everywhere which because they don’t forage more than1,200 ft. from their nest means that there were little nests tucked away all over the place. 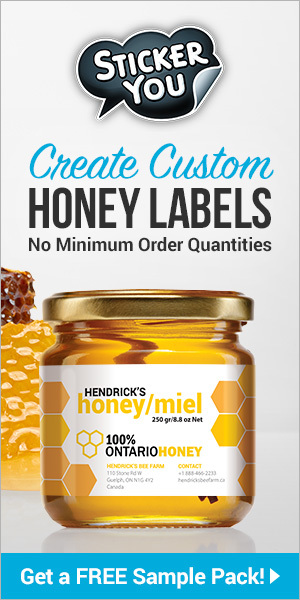 Angel bees of course make honey, called miel de angelita, little angel honey. Miguel harvests it sparingly, for there’s not much of it, and like other Melipona honey it is greatly prized for its medicinal qualities, especially alleviating eye problems. The Gamboa family’s reserve, with its 18 AHB hives, log hives of Melipona costarricensis, hive-ettes of angel bees, educational center, walking trails and fount of knowledge that Miguel possesses and is eager to share, seems to me to exemplify the pura vida ethos. Miguel and his family are deeply connected with and profoundly appreciative of their land; forest, plants, animals and insects thriving beneath the verdant canopy. They have also discovered that tourists, (more than two million last year, a healthy percentage of whom were eco-tourists, people interested in hiking, biking, rafting, surfing, snorkeling, bird-watching and now bee-watching), really like it too. 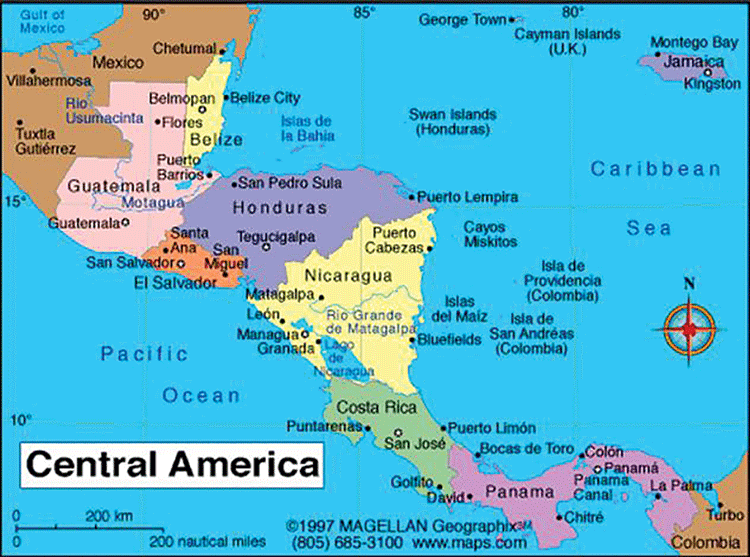 And, happily for us, they’ve created a cottage industry wherein they share their love and knowledge of the treasure that is their tiny pocket of Costa Rica and earn a living in so doing. Miguel encourages you to contact him via email at migamb@hotmail.com if you are interested in visiting. I encourage you also – Pura Vida.